YOUR SAFE CHARGER ZONE! CHARGE UP your mobile device! chargerFi will enhance your customer’s experience. In today’s economy, it’s harder to keep profits up while surpassing your competition. That is why we’ve come up with a way for you to offer the next level of service, attracting more customers while keeping them happier, longer. 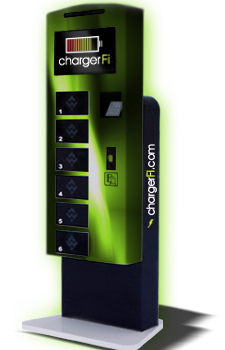 chargerFi is an innovative Wall Mount Phone Charging Station that integrates deposit lockers, cellphone charger and advertising display, allowing your patrons and guests to charge and store their devices safely. It charges multiple devices such as iPhone®, Blackberry®, Nokia®, Samsung®, LG®, Motorola®, Sony® Ericsson, Sharp®, HTC®. This model also includes a 19 inch touch screen monitor for operation. chargerFi features full multimedia support allowing you and your advertisers static and :15 video advertising opportunities. security: chargerFi is a steel, water resistant locker system that can only be opened with the users pin number or credit card. 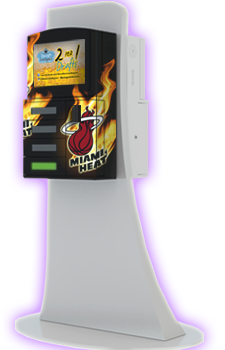 Our chargerFi stations can be utilized in unsupervised locations featuring a high-quality steel body. Our mission is to provide a reliable, convenient, and most importantly, secure mechanism for individuals to increase usability of one’s cellular device. It is difficult to exist in our technologically based world without our mobile device. chargerFi is here to keep you running, both personally and professionally by increasing battery power through a safe and effective means. chargerFi promises to deliver a safe, secure and dependable location to provide an invaluable service to everyone.